We are in the middle of a cold snap here in San Francisco. A mild one, as far as cold snaps are concerned, but reason enough to reaffirm my friendship with my oven. It has been working overtime - granola, batches of cookies, gratins, and yesterday this seeded flatbread. 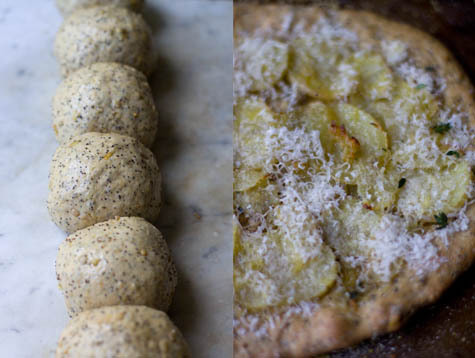 The flatbread is made from white whole wheat flour along with pepitas, sunflower, poppy, and mustard seeds. You can pull the dough out paper thin or leave it a bit thicker, serve it straight or bake it with toppings. Whatever you like, really. I actually stumbled on some flatbread notes while tidying up my desk. I tried to do a version a while back using whole, uncooked millet and quinoa. The notes in the margin cautioned me to use less crunchy ingredients the next time around, ones less likely to crack a tooth ;). 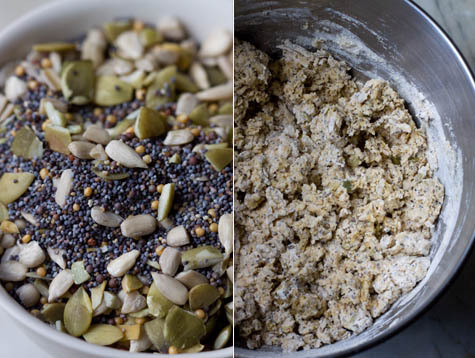 This time I went the seed route, and my one mistake was not crushing the mustard seeds before adding them to the rest of the ingredients - but I've adjusted the recipe to take this into account. When I pull the flatbread dough extra thin, I sometimes add a thin later of toppings. The version in the photo below was baked with paper thin slices of sauteed potatoes, a bit of cheese, a pinch of fresh thyme. When I leave the flatbread a bit thicker, like you see in the first photo, I usually skip the toppings, preferring it right out of the oven with a bit of salted butter - and preferably alongside a big bowl of soup. And just a reminder, you need to make the dough the night before, it takes about 10-15 minutes to prepare the dough, and then you pull it out and bake it the next day. This recipe makes a hearty, dense flatbread. If you tend to like your breads slightly lighter, I'd recommend starting with 1/2 unbleached all-purposed flour & 1/2 white whole wheat flour to see how you like it. You can play with the ratio in future batches based on that. If you have trouble finding white whole wheat flour, using all unbleached all-purpose flour will work. 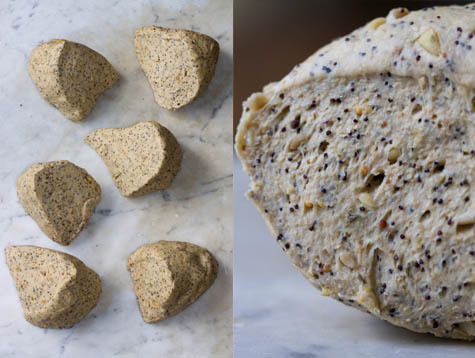 I have a note to myself to try a spelt flour version as well, and to add some wheat or oat germ that has been pulsed into a flour in a food processor. For those of you who are curious, I have been using King Arthur brand White Whole Wheat Flour. And once last thing, if your whole grain flour starts to smell soapy and generally off, it has probably gone rancid, and needs to be replaced. Stir together the flour, salt, yeast, and seeds in the bowl of an electric mixer. By hand stir in the oil and the cold water until the flour is absorbed. Switch to the dough hook and mix on medium speed for 7 minutes or so, or as long as it takes to create a smooth, sticky dough. As you are mixing, the dough should clear the sides of the bowl but stick to the bottom of the bowl (to me it looks a bit like a tornado). Add a touch of water or flour to reach the desired effect. The finished dough will be springy, elastic, and sticky, not just tacky. Transfer the dough to a floured counter top. Cut it into 6 equal pieces and mold each into a ball. Rub each ball with olive oil and slip into plastic sandwich bags. Refrigerator overnight. When you are ready to make flatbread (anytime in the next few days), remove the desired number of dough balls from the refrigerator at least 1 hour before making the bread. Keep them in a warm place, covered, so they don't dry out. At the same time place a baking stone on a rack in the lower third of the oven. Preheat the oven to 450 degrees. If you don't have a baking stone, you can use a sheet pan, but do not preheat the pan. Generously dust a peel or a sheet pan with a bit of semolina flour or cornmeal and get ready to shape your dough. Uncover or unwrap the dough balls and dust them with flour. Working one at a time, gently press a dough round into a disk wide enough that you can bring it up onto your knuckles to thin it out. You can pull it as much or as little as you like. The dough in the lead image was pulled about 6-7-inches, and the one further down the page was pulled paper thin. If the dough is being fussy and keeps springing back, let it rest for another 15-20 minutes. Place the pulled-out dough on the prepared pan, and jerk the pan to make sure the dough will move around on the cornmeal ball-bearings (you don't want it to stick to the pan). Add your toppings if you are using toppings (less is more!) and slide the topped pizza onto the baking stone. Bake until the crust is crisp and nicely colored - I start checking on it after 7 minutes or so, but it can take quite a bit longer depending on how thick or not thick you've pulled it. Remove from the oven. A single-pot lentil soup with brown rice. Made by browning some onions, adding the rest of the ingredients, and simmering until the whole lot until its done. From the new Anna Thomas cookbook, Love Soup - a soup cramming more spinach, leeks, sweet potatoes and chard into each bowl than I ever thought possible.